The General Hospital of Port Arthur. In 1928 construction of the General Hospital of Port Arthur began, and in 1930 the doors were opened to the first patients. Its storied 74 year history was about to begin. In one of the most disastrous events in Port Arthur’s history, the Saskatchewan Wheat Pool 5 Elevator exploded on August 7, 1945 at 10:34 a.m. leaving eighteen men dead, thirty-five injured, and four unaccounted for. All injured men were brought to the General Hospital for emergency treatment & recovery. Senator N.M. Paterson (middle) with the Cobalt unit. 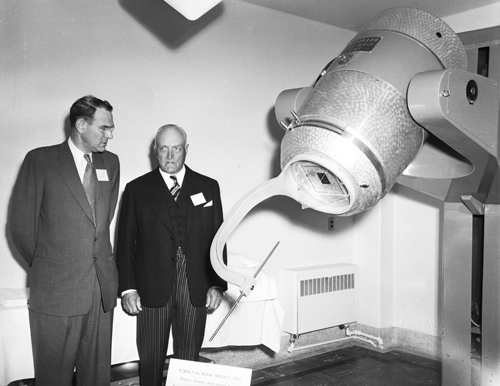 In 1954 Senator N. M. Paterson presented the Ontario Cancer Treatment and Research Foundation with a Cobalt Beam Therapy Unit. A two-storey addition was built on the West Wing of the General to provide accommodation for the installation of this gift. The Cobalt was a breakthrough piece of radiation treatment equipment for its time, and the forerunner to the outstanding state-of-the-art cancer care we have today at the Thunder Bay Regional Health Sciences Centre. Terry Fox is a name synonymous with hope, dedication, and courage. On September 1, 1980 — after running half way across Canada — pain and shortness of breath forced Terry to end his Marathon of Hope just outside of Thunder Bay. He was taken to the Emergency Department of the General Hospital of Port Arthur and received excellent medical care, and soon returned home to British Columbia where he learned his cancer had spread to his lungs. In 1988 the Heart Campaign was launched at the GHPA. Dr. Chris Lai was instrumental in establishing the Cardiac Care Unit at the Hospital, and his decades of work have ensured the success and continuing development of great Cardiac Care at the Health Sciences Centre. The three stones that adorned the top of the General. In 2004 the General Hospital of Port Arthur was closed when the Thunder Bay Regional Health Sciences Centre was built, and in 2010 it was demolished. 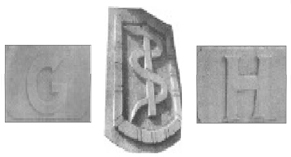 While the other former local hospitals were converted for new uses, all that remains of the General are the three stone blocks on the upper façade depicting the Rod of Asclepius, neighboured on either side by a large G and H.
Join our committee in Remembering the General. 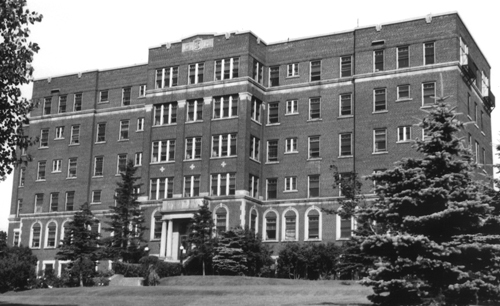 Help us build a monument to forever honour and remember the General and the many men and women who devoted their lives to the management and everyday operations of this important part of Thunder Bay’s healthcare history.